Sainsbury's has reported its first full-year loss for 10 years as the fierce competition within the UK grocery market continues. The UK's third-largest supermarket chain reported a £72m loss in the year to 14 March. The results were hit by a number of one-off costs, including a writedown in the value of some of its stores. Excluding the one-off costs, underlying pre-tax profits fell 14.7% to £681m, compared with £798m the year before. Underlying group sales fell 0.9% to £26.1bn, while like-for-like sales - which strip out new store space - fell 1.9% as the chain faced competition from discount chains such as Lidl and Aldi. Sainsbury's shares closed down 3.16%. It follows a general trend in slowing growth for the supermarket industry. The latest figures by supermarket research body Kantar Worldpanel, showed that, compared with last year, revenue growth overall for UK supermarkets slowed to 0.2% during the first three months of 2015 - a loss of £532m worth of sales. Sales at Morrisons and Co-op also fell by 1% compared with last year. These are the first full-year results that chief executive Mike Coupe has presented since he took over from Justin King last year. In the results statement, Mr Coupe said: "The UK marketplace is changing faster than at any time in the past 30 years which has impacted our profits, like-for-like sales and market share." Sainsbury's share in the supermarket industry is 16.5% - a fall of 0.1% compared with last year. Meanwhile, disount competitor Aldi has seen its market share grow by 15.1% in the last year - it now makes up 5.4% share of UK supermarkets. The combination of falling fuel prices and cheaper goods generally for shoppers has had an impact on supermarkets, Mr Coupe told the Today programme: "With customers having more money in their pocket, they tend to eat out rather than eating in so that has a drag on the supermarket industry." Last month, the UK's largest supermarket, Tesco, reported an annual loss of £6.4bn. Much of the loss was down to a decline in the value of its property portfolio. Tesco also saw its revenue fall by 1% in the first three months of 2015, its supermarket share now 28.4% - 0.4% less than at the same time last year. The supermarket sector in general is suffering because of increased competition from cheaper stores, which has triggered a price war between the big chains. 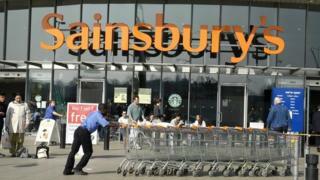 Sainsbury's said in November that it would spend £150m on cutting prices in its stores. While competition for food sales remains fierce, Sainsbury's said its non-food business was doing well. Sales of general merchandise grew by more than 7%, with clothing sales up nearly 12%. Sainsbury's annual loss reflects changes in the way customers shop, says Marc de Speville of consultancy Strategic Food Retail. "It's a shift away from the big weekly shop in favour of convenience stores and limited assortment discounters Aldi and Lidl that consume less time and money. "On top of that, the cost of fulfilling online orders, which now account for around 5% of the market, is being increasingly heavily subsidised by the retailers; the space race is effectively moving online. "It is not yet clear whether cutting costs, prices and stores - ie more of the same - will be sufficient to address the structural changes affecting the supermarket industry." Sainsbury's said it saw a 16% growth in sales at its Sainsbury's Local sites, and continued to open one to two new convenience stores per week.